"It's round up time on the Double-R-Bar, so saddle your horse 'cause we're gonna ride far!" 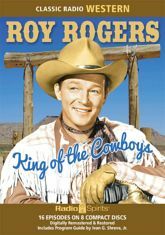 Ride with Roy Rogers (The King of the Cowboys) and Dale Evans (The Queen of the West) in sixteen tales of sagebrush adventure set in the modern west! For company, you'll have "the wisest trail scout of them all" Jonah Wilde (Forrest Lewis), his friendly nemesis the town sheriff (Herb Butterfield), and those music makers The Whippoorwills. From cattle rustlers to counterfeiters, the black hats always lose when this gang saddles up!